The first name that pops into everyone’s mind when the Civil Rights movement is mentioned is Martin Luther King Jr. How long would it take for a woman to come to mind? Morris, who used to teach in the Department of History at DePauw, presented the Civil Rights movement in a way that centered Black women. “This presentation then is an exercise in not only including women in the narrative, but understanding the movement itself in a different way because it was transformed by the Black women activists,” Morris said. 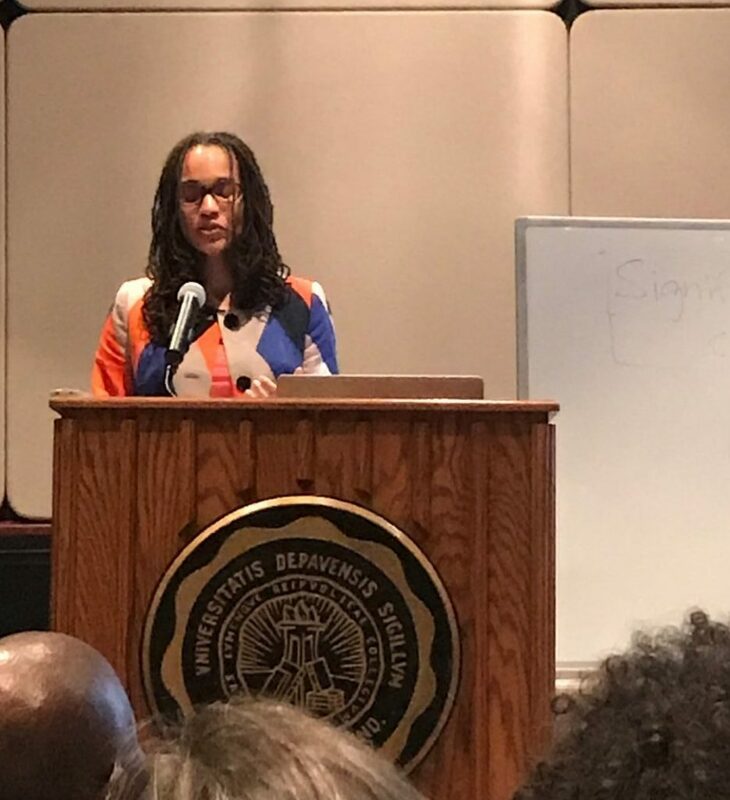 Throughout her talk, Morris named different activists who changed the course of the Civil Rights movement, showing Black women’s crucial contributions. She also emphasized the need to be critical of how women are remembered in history. Morris mentioned Rosa Parks as an example, who is usually presented as a simple woman who enacted one single act of protest. “She [Parks] wasn’t a tired old lady, she was a seasoned political activist,” Morris said. Although Parks is the only woman people usually think of when discussing the Civil Rights movement, Morris brought many more women’s names to the conversation. Including Ella Parks, who Morris described as the most important woman activist of this time. Parks helped start the Students Nonviolent Coordinating Committee and encouraged young activists to take the lead in organizing. Morris described Parks as someone who had the “social mobility that transcended” any one organization. Now a professor at The Ohio State University in the department of African American and African Studies, Morris has also written a book titled Womanpower Unlimited and the Black Freedom Struggle in Mississippi about an organization that was founded by Black Women to help the Freedom Riders. The organization, Womanpower Unlimited was founded in 1961 by Claire Collins Harvey, who owned her own business in Jackson, Mississippi. Womanpower Unlimited would buy supplies and send them to the prisons where the Freedom Riders were imprisoned as well as provide housing and food when they were released. “Freedom Riders collectively believed that Womanpower success was indispensable to their sanity and their endurance,” Morris said. Morris’s visit to DePauw marks the first Black History Month event and happened on the same day that the Association of African American Students (AAAS) celebrates 51 years since the organization was founded at DePauw. Morris was an advisor for AAAS when she taught at DePauw. Trish John, vice president of AAAS, said that Morris’s talk showed how women are not acknowledged for their activism and gave her names to reference. As the first event of Black History Month, John appreciated how Morris made room for connections beyond a historical point. As a Black woman activist, John said “these are the things that I live for” when discussing Morris’s talk. “I hope a lot of people took the idea that there are a lot of names similar to how there are a lot of powerful Black women on this campus who have done things and are doing things that don’t get enough credit,” John said.